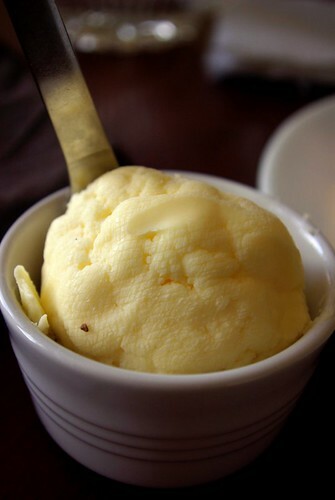 fresh heavy cream butter, originally uploaded by aarn! +14th April, 2009+. using the whisk attachment (in a chilled mixing bowl) on the stand mixer, mixed a pint of heavy cream and a pinch of salt on a high speed until it was thick whipped cream. then switched over to the paddle attachment and churned on one of the slower speed settings, slowly adding about 1c. of cold tap water. let this mix for about 20-minutes until the butter had separated from the liquid, then dumped the mixture through a cheesecloth lined strainer, wrapped and lightly squeezed the remaining water out of the butter with the cloth, and then refrigerated until ready to go onto the table. if water hadn't been used to aid in the separation, the strained liquid would be traditional non-cultured buttermilk...maybe next time. this butter was served with fresh bagels.